Undefined subroutine &main::right_page_cgi called at /usr/libexec/webmin/virtual-server-theme/recollect.cgi line 10. Undefined subroutine &main::right_page_cgi called at /usr/libexec/webmin/virtual-server-theme/config.cgi line 98. [12/Jan/2015:22:55:07 -0600] [192.168.1.77] /recollect.cgi : Perl execution failed : Undefined subroutine &main::right_page_cgi called at /usr/libexec/webmin/virtual-server-theme/recollect.cgi line 10." [12/Jan/2015:23:16:50 -0600] [192.168.1.77] /config.cgi : Perl execution failed : Undefined subroutine &main::right_page_cgi called at /usr/libexec/webmin/virtual-server-theme/config.cgi line 98. It appears that there are bugs in Virtualmin Framed Theme, which is the default global theme. The solution is simple: Either wait for an update which fixes the bug, likely in virtual-server-theme version 9.0-2 theme package (broken one is version 9.0-1), or you can install and change to Authentic theme, which does not affected by the bug. Authentic theme is a Webmin/Usermin/Virtualmin/Cloudmin theme based on Bootstrap and Font Awesome that is much superior and much better. Virtualmin is going to switch to Authentic theme anyway sometime in the future. 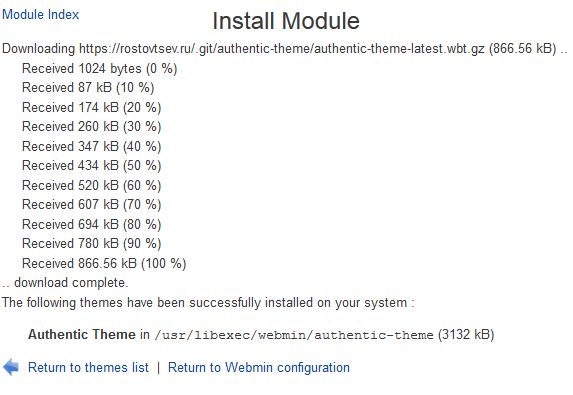 When installation is done, go to Webmin -> Change Language and Theme. 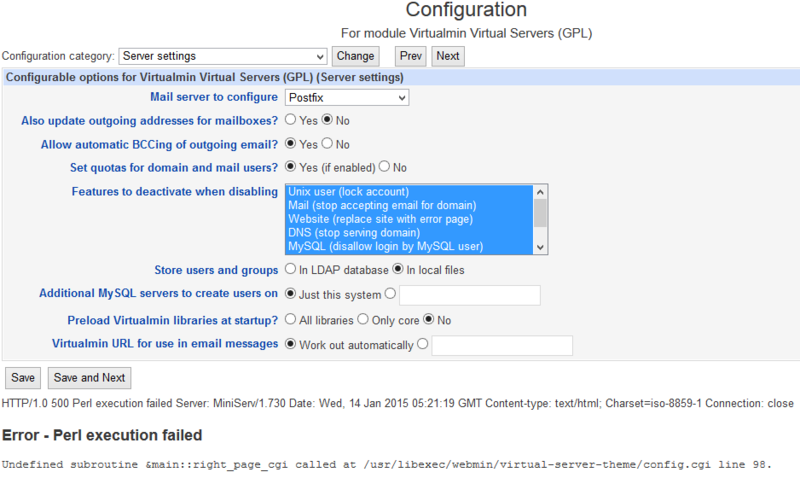 In the Webmin UI theme section, select Personal choice radio button, then select Authentic Theme in the drop down list. Click Make Change when done. Voila, you now administer the server and web hosts in a beautiful theme, and Perl error now goes away.